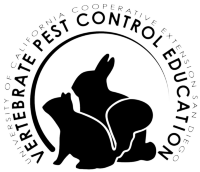 The Vertebrate Pest Control Education Program provides flexible multimedia outreach and education focused on agricultural vertebrate pest control including pesticide application and trapping practices of wildlife in the state of California. Here you can also find information on acquiring study materials to assist you in preparing for the Private Applicator Certificate (PAC) exam as well as links to various handbooks for species specific Best Management Practices (BMPs). PLEASE NOTE: Our Online course certification is currently unavailable for both Department of Pesticide Regulation (DPR) and Structural Pest Control Board (SPCB). Continue to Vertebrate Pest Control Education website.